Previous post and introduction to Pucuk Paku Kubok or also known as Paku Uban here. Among the older generation of the Iban, pucuk paku kubok is believed to have its health benefit whereby it is consumed during confinement period. It is believed that the consumption can increase the production of breast milk for lactating mothers. 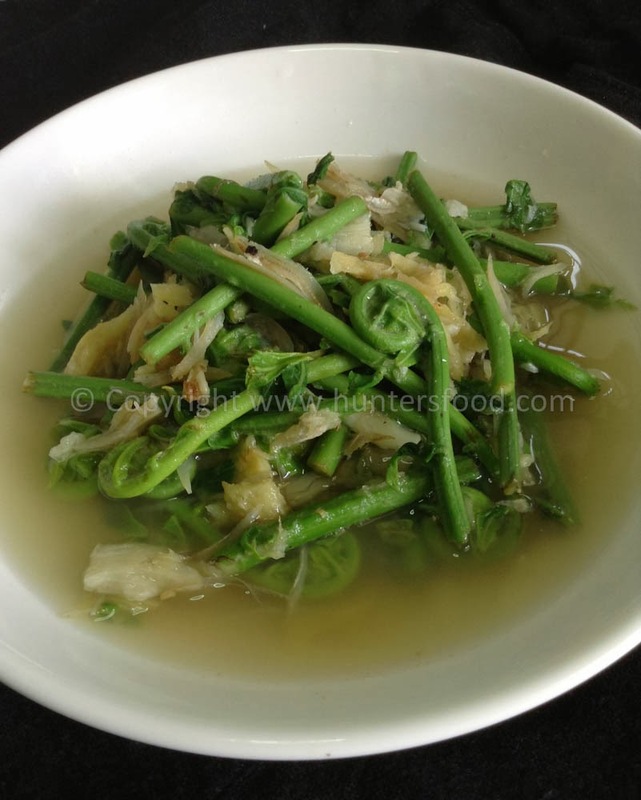 This version of pucuk paku kubok is cooked in a very healthy manner. No oil is use and ginger is used to reduced the 'wind' and to provide heat to the body. The amount of salt is also limited to about a pinch. 1. Toast garlic and ginger on a pan without any oil. 2. Once fragrant, add in half a cup of water. 3. Add-in paku kubok and stir until tender. 4. Add in anchovies for additional flavor, and a pinch of salt.